HomeBlogSEOWhich search marketing superhero are you? 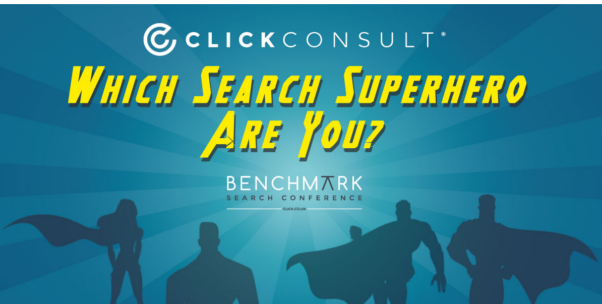 Which search marketing superhero are you? This quick quiz will match you not only with your superhero persona, however, but also with one of the Benchmark speakers from the current event – a must see to develop your particular superpower. So, prepare yourself to discover the real you, identify your search marketing superhero and get ready to tackle whatever comes your way. With a whole day of search marketing expertise sharing that includes talks and panel sessions, Benchmark is a unique, free conference that can ensure you’re prepared for what lies ahead in digital. For an indication of what Benchmark has to offer, check out our conference resource page. Whether you are simply looking to learn from some of the tremendous speakers that have presented in past years, need to revisit a talk you have particularly enjoyed whilst attending a previous years’ conference yourself, or deciding whether to attend this year, our conference resources are full of useful, actionable content and every talk from previous years. Which hero did you get? Let us know by either commenting below or using the #BenchmarkConf2017 tag. Need a hero? Contact us today. Benchmark Search Conference 2017: The Final Line-Up. Don’t Miss Out!